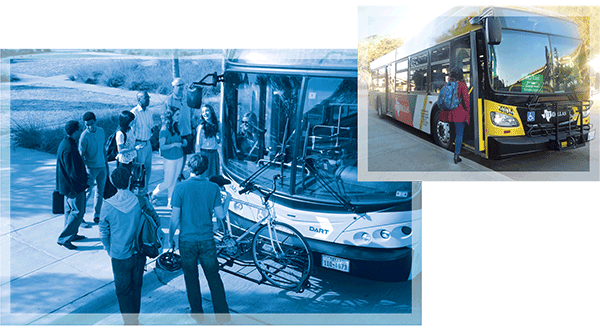 (Top) UT Dallas and DART recently renewed their Comet Cruiser shuttle agreement, with routes that connect the campus to CityLine/Bush Station and the community. (Left) Eligible DCCCD students can receive a free local DART GoPass, which will reduce the transportation barrier for many people wanting to advance their education. Student success is a priority for the Dallas County Community College District. The DCCCD Board of Trustees approved $1.2 million to provide free local DART passes for eligible students at all DCCCD colleges, beginning with the Spring 2017 semester. "Transportation is a big barrier for many of our students, and our partnership with DART to provide a Student GoPass to those who are eligible is one way to remove that obstacle," said Dr. Joe May, DCCCD chancellor. "We know that removing barriers gives students a chance to go to college, earn a credential and start a career." Several other colleges participate in DART's Higher Education Pass Program, including Southern Methodist University, The University of Texas at Dallas, UNT Dallas College of Law and The University of Texas Southwestern Medical Center. In October 2016, DART opened UNT Dallas Station on the Blue Line, giving students an easier way to reach campus by transit. During the design phase, the agency conferred with officials at the University of North Texas at Dallas to ensure that the new station complemented the growing campus's master plan. In July, UNT Dallas broke ground on its first residence hall, which is scheduled to open this fall. Students who live on campus will be able to use DART to run errands, reach jobs or explore the area without a car. At The University of Texas at Dallas, located in Richardson, the Comet Cruiser Route 883 connects the campus to the rest of the DART System via CityLine/Bush Station, as well as to nearby apartments and shopping destinations. Public transit is a lifeline for many students who don't have vehicles. And for faculty, staff and students looking to reduce commuting costs, the shuttles create a viable travel alternative. "As we examined the infrastructure of our rapidly growing university, we decided to take a multimodal approach to transportation and parking," said Dr. Calvin D. Jamison, UT Dallas vice president for administration. "I think we've created a positive, comprehensive model of how to use public transit to move individuals on and off an urban college campus." DART also has shuttle partnerships with SMU and UT Southwestern.